...is the oldest brick structure in the city. The light keeper’s house was added to the site in 1876 and was where the light keepers and their assistants lived and worked. Today, visitors from all over come to view this beautiful beacon, learn its fascinating history and climb the 219 steps to the top. But others come for different reasons. They come to satisfy their curiosity about the paranormal, to discover if the stories they’ve heard are true and if it is possible that ghosts really do exist. With its long and intriguing past, it’s not surprising that the St. Augustine Lighthouse has gained a haunted reputation. Many who’ve visited it, worked here, and others who live close by, have reported experiencing something inexplicable, mysterious and just plain eerie. There have been so many reports that several paranormal experts have come to investigate, including the popular TV show, Ghost Hunters. One of the lighthouse’s first keepers was a man named Peter Rasmussen. He was known for his meticulous eye and watchful manner of maintaining the lighthouse. He was also known for his love of cigars and is one of the first ghosts that people report coming in contact with. Over the years, the smell of Peter’s cigar has been detected by many, including staff members and guests. Others have seen and heard another keeper, Joseph Andreu, at the top of the tower; only he’s been dead for more than a century. His presence at the lighthouse could be explained by the fact that he fell to his death while painting the outside of the tower. His spirit never left and is often seen looking out from the top. 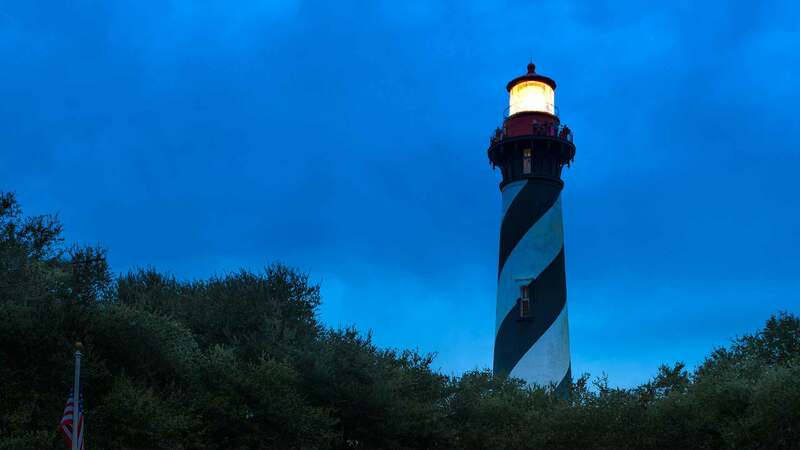 But perhaps the most well known ghosts of the St. Augustine Lighthouse are that of the two young sisters who also died on the property. Hezekiah Pity was hired to renovate the tower in the late 1800s. Her daughters, Eliza and Mary, were playing inside a cart that was being used to carry materials back and forth to the lighthouse. When the cart broke loose, they weren’t able to jump out in time and the cart slid rapidly into the bay, plummeting both girls to a watery death. Today and most days since then, the girls can be heard laughing at the top of the tower late at night. Others have spotted Eliza floating about the grounds wearing the same blue dress she died in. Inside the lighthouse and around the property, many are often spooked by strange and eerie events that they just cannot explain. Staff members say that they lock the door at the top of the tower each night before leaving – yet the door is often open in the morning when they arrive for work. The lighthouse staff also reports that chairs have been moved or overturned and that various items in the gift shop were moved or missing, only to reappear later. Music boxes have been known to turn on by themselves. Some say while touring the light keeper’s quarters they feel cold and that the figure of a tall man has appeared before them, and then disappeared. If you’ve never visited the St. Augustine Lighthouse, be sure to stop by for a tour when you’re in town. They offer daily tours and some evening and moonlight tours. Make the climb to the top to witness the magnificent view and keep your eyes wide open; you never know who or what you’ll encounter.